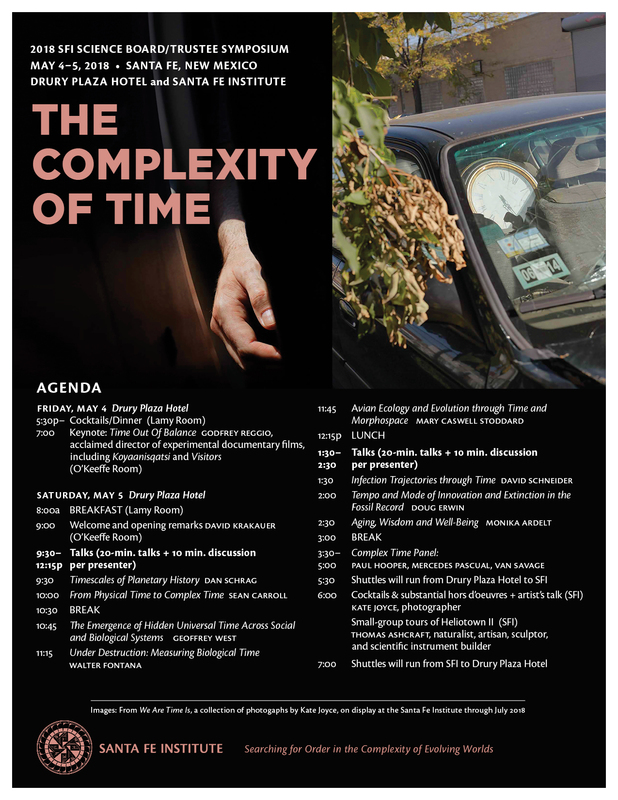 The theme for the 2018 Science Board/Trustees Symposium is Complex Time/Adaptation, Aging, & Arrow of Time (AAA), SFI’s new five-year research initiative funded by the James S. McDonnell Foundation. The concept of time pervades everything that we know about the physical and biological universe. Order and disorder resulting from the asymmetry of time on nested timescales gives rise to complex adaptive systems. Adaptive phenomena cannot be trivially reduced to the simple timescale of physics and chemistry. In adaptive systems, aging is explicitly a consequence of information gain (adaptation) and information loss (entropy). AAA will investigate phenomena bearing on the arrow of time through the lens of complexity science in both living and non-living systems, including connected subsystems that operate concurrently at different scales and rates.